copyranter: After reading this ad, you will never walk near an Australian construction site ever again. 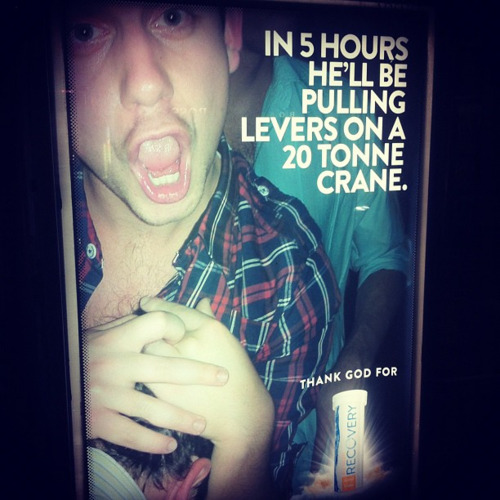 After reading this ad, you will never walk near an Australian construction site ever again. "Recovery" sells hangover "remedy" pills and drinks. That's quite a photo. If he also washes his alcohol-soaked body with Axe "Recovery" hangover curing shower gel, he'll be as good as new, I'm sure. Wow, I thought that was a PSA at first. But no, ha ha! Let's get wasted and operate heavy machinery! With this ineffective remedy, we can! Saw this ad at a tram stop in the city of Melbourne during the Easter break the ad opposite this one had similar imagery, but said he’d be operating a nail gun! Too many people die or are seriously injured from operating heavy machinery. To promote and glamorise irresponsible behaviour which will be solved by this product is shameful and down right dangerous. Australia has major campaigns highlighting the real issues of fatigue and driving under the influence, this campaign has made a mockery of a real issue and the people who have been affected (many of whom are young men). haha the insight is too legit- coming from aus i can say that. it would work on labourers, especially after the 4 day long weekend we have.